This year, Luxury watch brand GRAHAM celebrates as the Official Timing Partner of the LA Kings Ice Hockey Team, winners of the 2012 NHL Stanley Cup Championship. The Los Angeles Kings are back and ready to play this season with GRAHAM as the Official Timing Partner of the successful American ice hockey team. The Kings headed into the 2012 Stanley Cup Playoffs in 8th place in the Western Conférence, and fought their way to the top, playing their final winning game on their home ice, for their first championship win. To celebrate this sought-after achievement and honour their hard work, GRAHAM has developed a limited edition in the vein of its adrenaline timepieces. 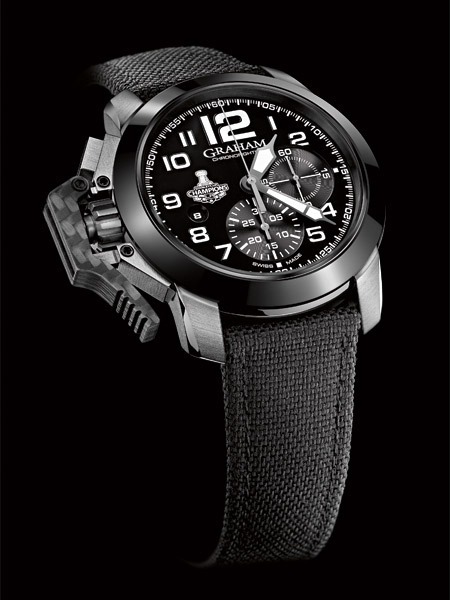 The Chronofighter Oversize LA Kings is highlighted with the LA Kings iconic team colours of silver, black and white. The start and stop lever on the left of the case, a renowned GRAHAM signature, is made of the same plain carbon material as carbon fibre NHL hockey sticks. It results from a very specific Swiss-made machining process. This means that the lever is a unique piece of carbon which provides the watch with more stiffness and enhanced usability. The black ceramic bezel gives the watch its strength and shining personality. The watch is light to wear and safe. And its performance goes far beyond technological limits. The wonderful 2012 Stanley Cup victory is set in stone on the side of the case at 3 o’clock. The “2012” inscription is engraved alongside a white diamond (0.014 cts). Players’ version of the watch will feature a black diamond. GRAHAM LA Kings limited edition will help these modern times sportsmen to move forward through real life conditions and reach ultimate success. Only 100 pieces will be available at selected retailers in Los Angeles from February. Main features also include: 47 mm steel case with a white diamond (0.014 cts) and 2012 inscription on the side at 3 o’clock, calibre G1747, automatic chronograph, 25 jewels, 28’800 A/h (4Hz), Incabloc shock absorber, 48 hours power reserve, black dial with LA Kings – Stanley Cup Champion logo at 9 o’clock, domed sapphire crystal with anti-reflective coating on both faces, smoked sapphire case back with LA Kings – Stanley Cup Champion logo and limited edition serial number, integrated black technofabric strap. Limited edition: 100 pieces.